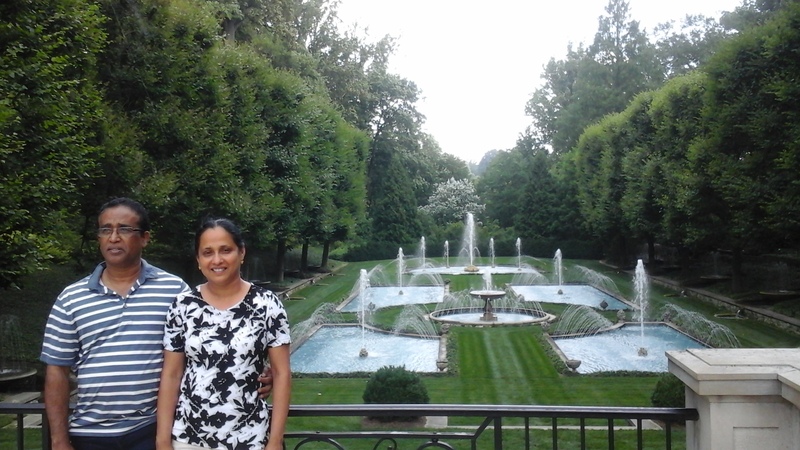 Visiting Marina’s sister Charm and her husband Cherian at Delaware, USA, every summer for the past decade, we always plan to visit the Longwood Gardens. 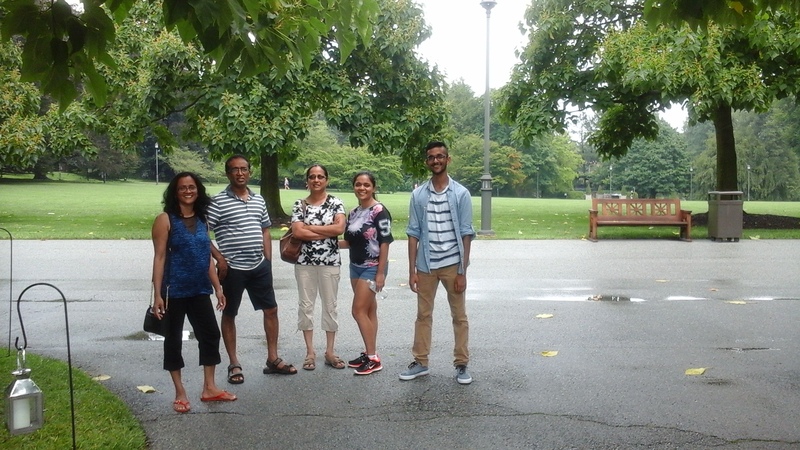 The visit materialised only in the summer of 2015. 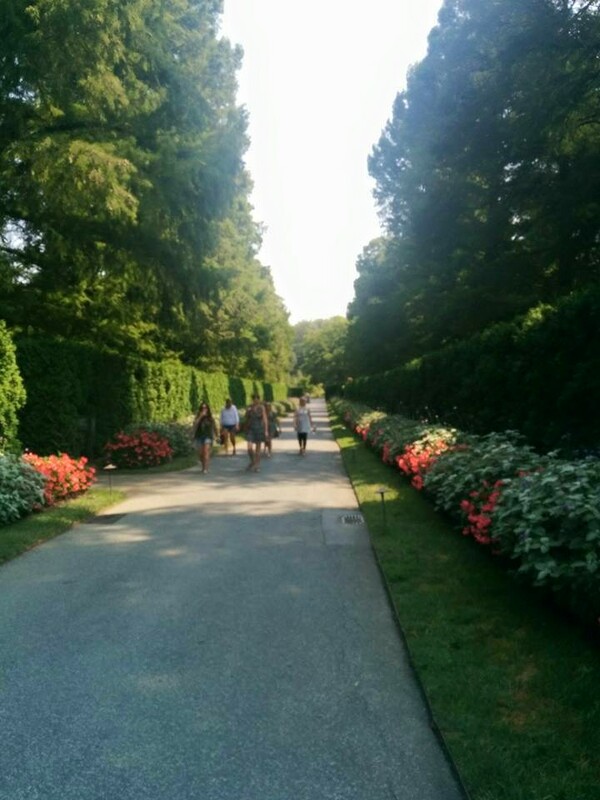 The Longwood Gardens, one of the world’s greatest gardens of today, was established by Mr Pierre Du Pont when he purchased Peirce’s Park in 1906 in order to save the trees in the park. The park owner had contracted a lumber mill operator to remove the trees from the park. Mr Du Pont was born in 1870 in Delaware, USA. He was president of the world famous DuPont Company from 1915 to 1919, and served on its Board of Directors until 1940. He also managed General Motors from 1915-1920, became GM’s president in 1920 and served on GM’s Board of Directors until 1928. During his early years in Wilmington, Delaware, he was influenced by the area’s natural beauty and by the Du Pont family’s long tradition of gardening. His jobs took him to Europe many a times and he was always exposed to a wide variety of garden settings, fountains, grand architecture and the latest technology. After buying the Peirce’s Park at the age of 36, Pierre started to create a garden, which today is the Longwood Garden. He built the gardens piecemeal, beginning with the Flower Garden Walk and he followed no grand plan or design. He added an open-air theatre in 1912, inspired by an outdoor theatre near Siena, Italy. He then added the “secret” fountains that drenched the unaware visitors. As a wedding gift to Alice Belin, whom he married 1915, he added a conservatory – Longwood’s first “winter garden” and planted exotic foliage and created a small marble fountain. In 1921, he opened the Conservatory, a perpetual Eden which used the latest technology of the day to heat, water, and power the complex. All the systems were hidden in tunnels so as not to detract from the grandeur of the glass-covered and surrounding rooms. He then opened the greenhouse to the public. By the mid-1930s, Longwood had grown from the original 202 acres to over 1000 acres due to Pierre’s purchase of 25 contiguous properties over the years. Today the Longwood Gardens has a yearly budget of nearly $50 million and a staff of 1,300 employees, students, and volunteers. Longwood is continuously evolving to become one of the world’s greatest gardens. The garden is open to visitors year-round to enjoy exotic plants and horticulture, events and performances, seasonal and themed attractions, educational lectures, courses, and workshops. The Longwood Gardens consists of 20 outdoor gardens and 20 indoor gardens within 4.5 acres of heated greenhouses, known as conservatories It contains 11,000 different types of plants and trees, as well as fountains. The Gardens also has extensive educational programs including a graduate program, and extensive internships. It hosts 800 horticultural and performing arts events each year, from flower shows, gardening demonstrations, courses, and children’s programs to concerts, organ and carillon recitals, musical theatre, fountain shows, and fireworks displays. It also hosts an extensive Christmas light display during the holiday season. Longwood Gardens is renowned for its extraordinary fountains. The astonishing shows gather attention from far and wide, and are a favorite among visitors of all ages. Inspired by the success of the Italian water gardens and open air theatre fountains, Mr Du Pont unveiled the Main Fountain Garden in 1931. The goal was to rival the fountains he had seen in Europe. Today, this open air theatre conducts fountain shows featuring 750 jets in changing patterns, this showpiece comes alive with five-minute shows set to music. Since its 1914 Garden Party debut, this Italian-style outdoor theatre has expanded from its simple original fountains to the 750 jets that create the rainbowed curtain of water. Tucked into a protected courtyard (accessed via the Conservatory), this stunning outdoor garden features aquatic plants from all over the world. The garden is open from late May through mid-October. Peak bloom occurs mid-July through September (depending on weather). The water-lilies and tropical aquatic plants are displayed here in five large pools. 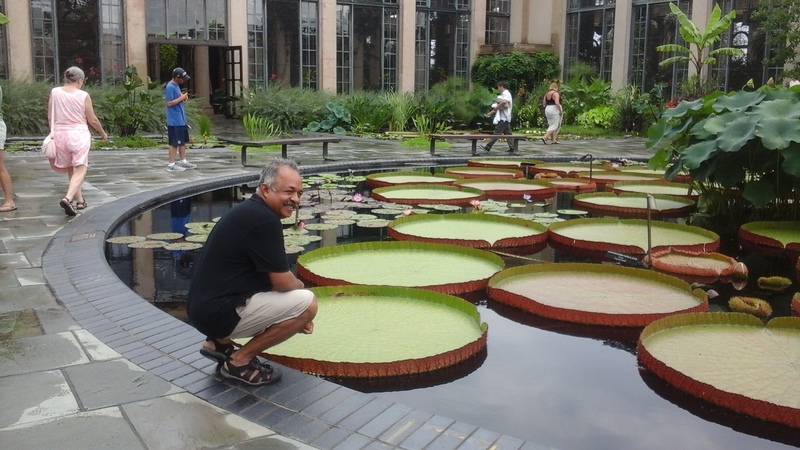 The aquatic plants consists of lilies, lotus and incredible Victoria water-platters with leaves measuring up to four feet in diameter. This leaf might have been used to float the infant Lord Krishna, to be discovered by Markandeya. The same leaf could have been used by Kunti to float infant Karna and also may have been used in the case of infant Moses. The Orchid House displays a fraction of the 7,500 orchids at Longwood Gardens. To ensure a continuous display, the orchid grower hand picks and replaces the plants three times a week with others from the five orchid growing houses. Orchids were a passion of Pierre Du Pont and his wife, Alice. 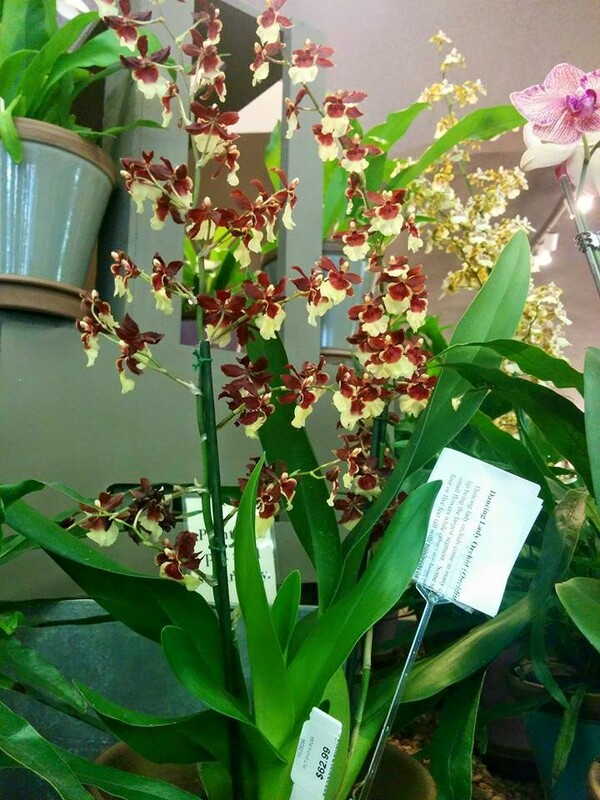 Orchids were one of the first plant collections—started in 1922. In 1948, the collection was greatly enlarged when Pierre DuPont’s sister-in-law, Mrs. William Du Pont, donated her well-known and respected collection of more than 2,300 orchid plants to Longwood. The Palm House opened on Palm Sunday, 1966 with a landscape of palms in all sizes and shapes from all around the world. 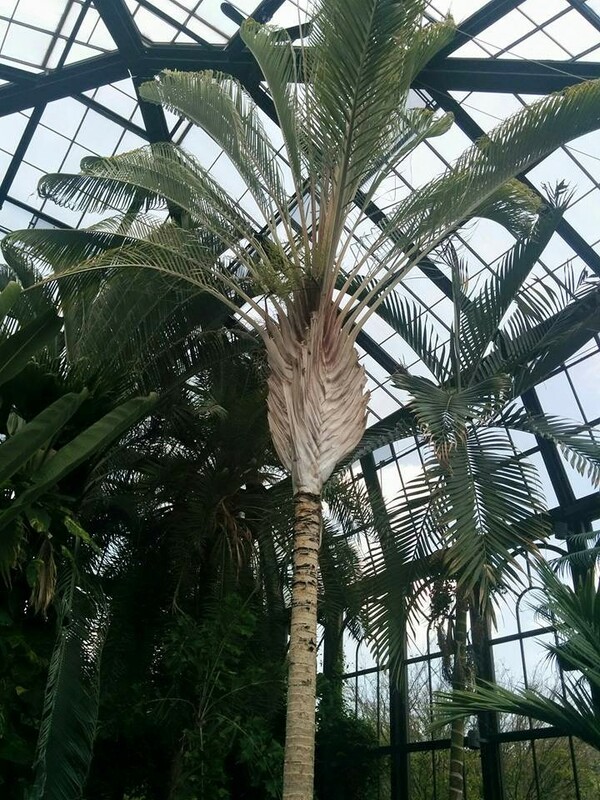 Mr Du Pont preferred temperate houses because they were less expensive to heat and only the small conservatory in the Peirce House was warm enough for an occasional palm. 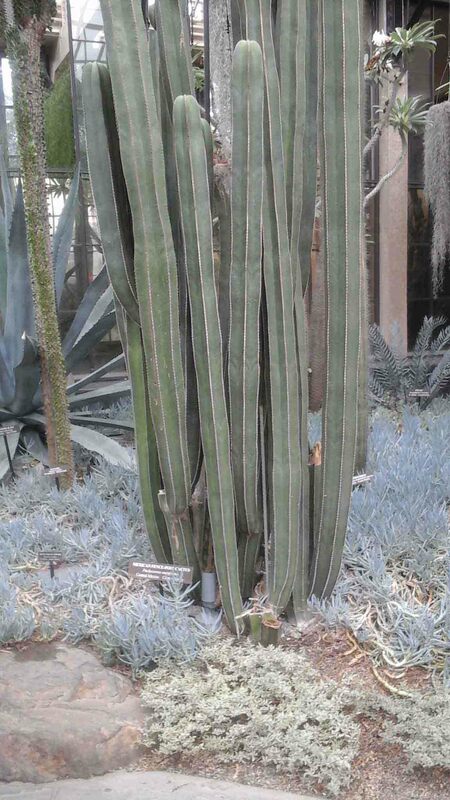 The Silver Garden houses the cacti collections. Through the glass roof the moonlight appear to bounce off the gray and silver-foliaged plants that fill this garden. This mimics the dry and arid landscapes found in Mediterranean and desert regions. Slate, rocky outcroppings, and exotic plants combine to create this multi-textured garden. The gray-blue slate pathway gives the impression of a dry streambed that would be found in a desert. The greenhouse containing this garden was built in 1921 and was originally used to grow peaches and nectarines. Following a major structural renovation, the Silver Garden came into being in 1989. These are some of the few specialities of the Longwood Garden and must be included in the itinerary of anyone visiting this part of America. How are you ?How is Marina ,Nidhi and Nikhil? 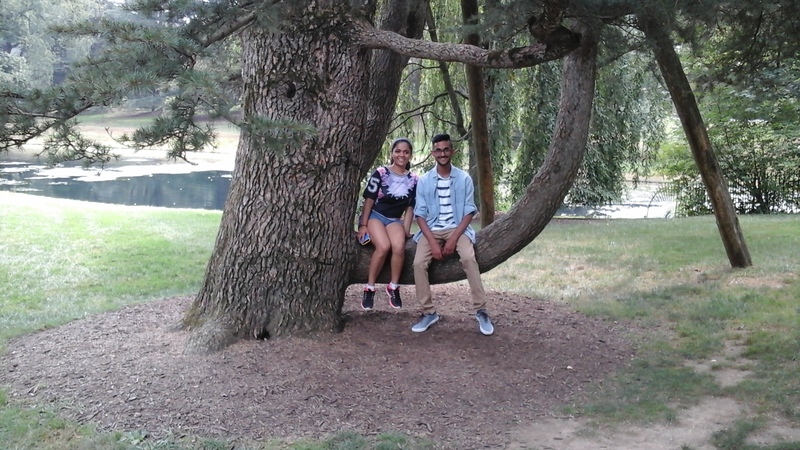 My friend Geetanjali Chatterjee is staying at Delaware. She wanted to read about this park. I have forwarded your article to her . Hope you do not mind……. She is keen to talk with Marina s sister too. Hi, We are all fine. Please forward any of my articles to your friends. Knowledge grows when shared.